Landlords who own rental property in the state of Utah should be aware of Utah’s landlord-tenant laws, including rules for the security deposit. Understanding and following these rules can help protect you in case you have a security deposit dispute with your tenant. You should also check with your local government to see if additional rules may apply. Here are some frequently asked questions about Utah’s security deposit law. Is There a Security Deposit Limit in Utah? No. The state of Utah does not place any limit as to the maximum amount a landlord can charge a tenant as a security deposit. However, it is common to charge between one and two months’ rent as a security deposit. Any more than this may deter tenants from renting your property. Any less than this may not be enough to protect you if a tenant breaches his or her lease agreement. Can You Charge a Nonrefundable Deposit? Yes. In Utah, landlords may charge a nonrefundable deposit. In order to do so, the landlord must clearly state in writing what portion of the deposit is nonrefundable. This statement can be written into an existing lease agreement or it can be a separate document. The tenant must read and sign this document before giving the deposit. How Must You Store the Security Deposit in Utah? There are no specific rules for how landlords in the state of Utah must store tenants’ security deposits. They do not have to be put into an account which is separate from the landlord’s funds nor do they have to accumulate interest. Is Written Notice Required After Receipt of the Security Deposit in Utah? No. In Utah, a landlord does not have to provide a tenant with written notice after receiving a tenant’s security deposit. However, landlords should include this as part of the lease agreement to help avoid any disputes in the future over the amount of the security deposit and when it was deposited. What Are Some Reasons You Can Keep a Tenant’s Security Deposit in Utah? Is a Walk-Through Inspection Required in Utah? No. Utah law does not require landlords to perform walk-through inspections prior to a tenant’s move-out. However, these inspections are beneficial to landlords. They allow the landlord to document the condition of the rental unit prior to tenant move-out. The landlord can notify the tenant if any deductions will be taken from his or her security deposit for damage to the unit. This gives the tenant time to remedy the damage or at least mentally prepares them for the deductions that will be taken. When Must You Return a Tenant’s Security Deposit in Utah? If a landlord in Utah intends to make deductions from a tenant’s security deposit, he or she must include a written itemized statement when returning the portion of the security deposit that is owed back to the tenant. This notice must state what deductions have been taken from the deposit and the amount of each deduction. It is the tenant’s responsibility to provide the landlord with the address where the security deposit and the itemized statement, if necessary, should be delivered or mailed. The tenant must provide the landlord with this information within 30 days of move-out. Utah landlords have 30 days after tenant move-out or 15 days after receiving a tenant’s forwarding address, whichever is later, to return the portion of the security deposit owed back to the tenant. If the landlord is keeping any of the security deposit to cover damage to the unit, the landlord has 30 days after tenant move-out or 30 days after receiving a tenant’s forwarding address, whichever is later, to return the portion of the security deposit owed back to the tenant. The deposit plus the written itemized list, if necessary, can be hand delivered or it can be mailed to the address the tenant has provided. 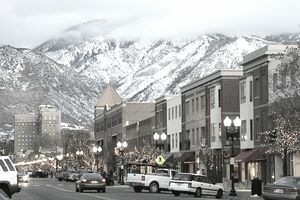 If a Utah landlord fails to return a tenant’s security deposit within the time specified, fails to provide the tenant with a written itemized list, if necessary, or wrongfully withholds all or a portion of a tenant’s security deposit, the tenant may be awarded his or her full security deposit and up to $100 in penalties plus court costs. What Is Utah’s Security Deposit Law? For the original text of the law that governs security deposits in the state of Utah, please consult Utah Code Annotated §§ 57-17-1 to 57-17-5.